DEBT stalks Africa once again. Over the past six years sub-Saharan governments have issued $81bn in dollar bonds to investors hungry for yield. Piled on top of this are murkier syndicated loans and bilateral debts, many to China and tied to big construction projects. Public debt has climbed above 50% of GDP in half the countries in sub-Saharan Africa. The risk of a crisis is growing. Consider Zambia. In 2012 this southern African country could borrow more cheaply than Spain. Now bond yields have jumped above 16%, suggesting that investors fear that it will default (see article). This fall from grace offers several lessons. The first relates to the “moral hazard” of debt write-offs. 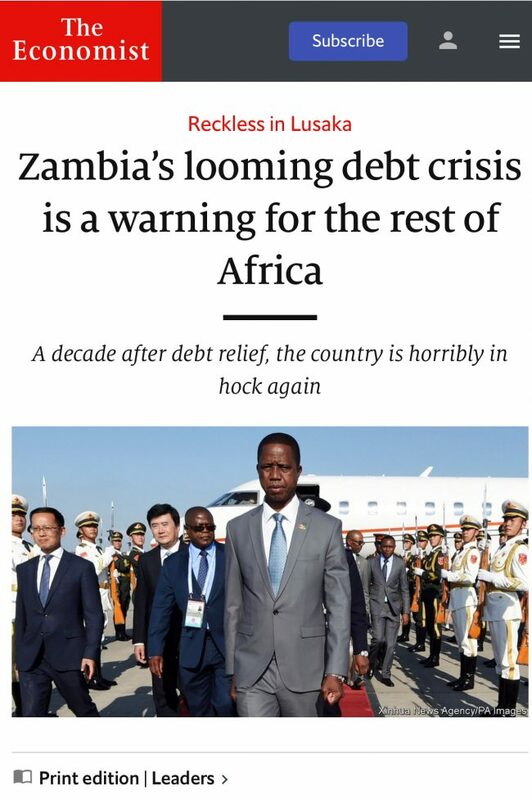 Zambia, along with 29 other African countries, had many of its debts wiped clean since 2005 under the IMF’s “heavily indebted poor countries” (HIPC) scheme. Sceptics such as William Easterly, an economist, warned at the time that debt relief would simply encourage more reckless borrowing by crooked governments unless it was accompanied by reforms to speed up economic growth and improve governance. To be fair, the scheme did a lot of good by freeing up money for schools and clinics. But Mr Easterly’s warning was prescient. Zambia took barely a decade to run up fresh debt worth 59% of GDP. The government blames a fall in copper prices from 2011. But the real reason is that Zambia is run by an inept and venal elite who used easy credit to line their own pockets. Much of the money Zambia borrowed was squandered or stolen. Bigwigs skimmed from worthy-sounding contracts. When the country bought bright new fire-engines their price somehow ballooned by 70%, to more than $1m each. Its new roads mysteriously cost twice as much per kilometre as its neighbours’. Its new airport terminal was designed to accommodate an improbable ten-fold jump in traffic. A slide into authoritarianism made corruption harder to check. Zambia’s main independent paper, which used to squeal about graft, was shut down. The second lesson is that an increasing number of creditors are willing to encourage irresponsible borrowing. By 2016, when it was clear that Zambia was hurtling towards a crisis, the IMF urged it to put a brake on new borrowing. A spike in interest rates in the bond market provided some discipline. Yet governments, particularly China’s, were happy to fill the gap. China now holds perhaps a quarter to a third of Zambia’s external debt. (No one knows how much—itself a cause for concern.) The regime has also asked for loans from Turkey, which has ambitions in Africa. That leads to the third lesson. The rules for how to handle Africa’s debt crises are changing. In the past much of the money was owed to the World Bank, IMF and Paris Club, an informal group of Western government creditors. This gave the fund the power to demand prudent economic reforms as a condition for help. Now China’s influence has risen—and it puts much less emphasis on good governance. The IMF’s clout has diminished. When the fund’s representative irked Zambia’s president, Edgar Lungu, the regime demanded his removal. Amazingly, the fund complied. Because so many competing interests are involved, Zambia’s latest debt mess will be much harder to unscramble. Western creditors and the IMF want the government to stop wasting money on overpriced infrastructure. But the Chinese banks that finance infrastructure projects are also large creditors whose short-term loans to Zambia need to be restructured. If projects are cancelled, they may refuse to roll over existing loans. Or they may demand to be given, say, Zambia’s state power utility as compensation. A crisis will be inevitable unless all creditors, China included, give the IMF the backing it needs to chivvy Zambia into getting its finances in order and its economy back on track. Alas, that seems all too unlikely.